Monopoly Plus is the latest Monopoly spin-off from world renowned slot developer IGT and joins the already popular slots of Monopoly – Here and Now and Monopoly – Pass Go in the IGT portfolio. 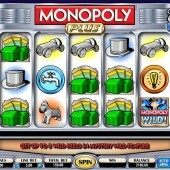 Monopoly Plus is a 5 reel, 30 payline slot that is, like its siblings, based on the popular board game of the same name. Personally, I grew up playing Monopoly with the whole family and as a youngster I was subjected to defeat after defeat as my family took advantage of my lack of understanding of the London property market. However, that is not a problem with this IGT slot. This slot is arguably the best Monopoly slot that IGT has released to date. There are so many features that it just feels that this game has so many dimensions to it and that is a fact that will lure players back time and time again. 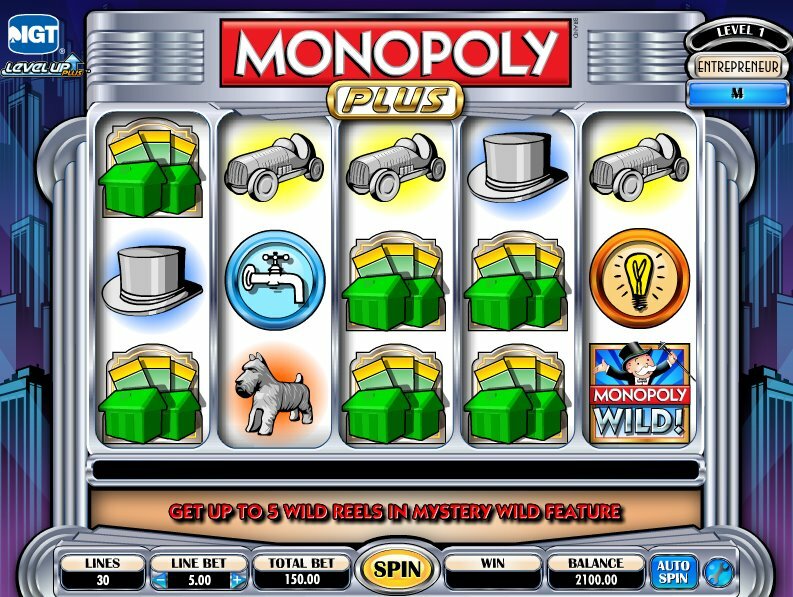 Watch Out for Mr Monopoly and the Mystery Wild Bonus! The most exciting feature in Monopoly Plus is the Mystery Wild Bonus feature. This can be triggered a random intervals when the Logo symbol does not appear on the first reel and the Board Bonus symbol does not appear on any of the reels. When triggered, Mr Monopoly will then pop up on the reels and hop from one reel to the next. Every reel that Mr Monopoly touches will turn the entire reel Wild giving you a great opportunity to increase your winnings. Another fascinating feature in Monopoly Plus is the Board Bonus feature. This is triggered when you hit three Board Bonus symbols on reels 1, 3 and 5. You are then presented with the Board Bonus symbols where you must pick one to reveal how many free rolls you receive. You can be awarded up to 4 free rolls. During these free rolls, you will start at Go and if you hit a double then you will earn an extra free roll. If you hit two doubles in a row then you will trigger the Jail Bonus. In the Jail Bonus, you have three attempts to roll a double. If you manage to do so then you will win 300x your line bet. There are other squares you can land on across the board that will award you prizes and free rolls. Landing on the Property Bonus will award you with free rolls or money depending on what the symbol on the middle pay-line is. If you land on the Utility Bonus then you will have to roll the Utility dice. The higher the number you roll, the larger the prize reward. There is also the Chance/ Community Chest Card where you are given a random card to draw that will ask you to move to a random place on the board. Extra rolls and prizes can be gained during gameplay with the Railroad Bonus, Free Parking Bonus, Go to Jail Bonus, Income Tax, Just Visiting, Super Tax Bonus and the GO Bonus. As if all of this was not enough, there is also the Level Up Plus feature. This is triggered when you reach the thresholds and you level up. When this happens you are awarded a new title and trigger new player moves or Board Bonus features. You can start as an entrepreneur and level up to become a luminary. When you level up there is also the chance to win larger prizes. There is so much going on in Monopoly Plus that it might put some less hardened slots players off. Monopoly fans will be all over this from the outset and even though it might appear to be slightly complex and confusing at face value, I recommend you at least give this a go. Even the doubters will be pleasantly surprised.